Besides posting on wall, sharing photos and chatting – now you can also listen to music tracks on Facebook with your online friends. Facebook has introduced new feature “Listen with” that allows you to listen same online music with your Facebook friends. This feature is seamlessly integrated within Facebook chat window to quickly identify friends listening music and join them in music session. 1. 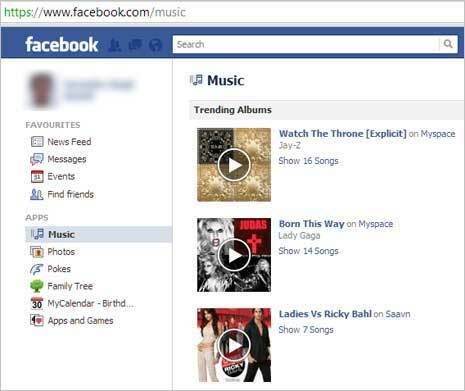 There are number of ways you can listen to music on Facebook. To make things easy, Facebook Music dashboard (at facebook.com/music) lists currently trending music tracks in your region. This listing is powered by external online music providers like MySpace, Saavan and so on. 2. Besides checking this listing, you can also listen to music with friends on Spotify.com and rdio.com websites (these are supported by Facebook as of now) by adding their respective Facebook apps to your Facebook account. You can add and use multiple music apps at the same time. Also, you can control these app posting activity on your timeline profile using audience selector and activity log options. Since these services (and apps) are not available in every country, then you may choose either of option available at Facebook Music Dashboard (as explained in step 1 above). 3. 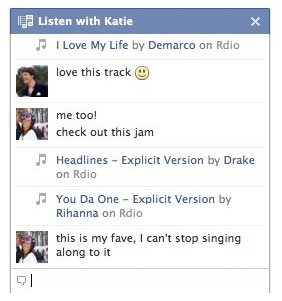 Once you start listening to music, your name is Facebook chat box will have ‘Music Note’ symbol next to it. Other friends can click your name in chat box (with music note symbol) and then click “Listen with” button to start listening same music as enjoyed by other friend on Facebook. 4. Besides simultaneous listening, you can also group chat about the music you are listening. As more friends listen to same music, they join the group chat for real time discussion.